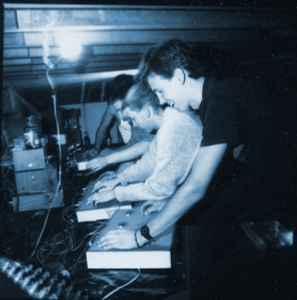 An experimental recording group in Seattle, WA started by UW DJs at KCMU Radio in the mid-80s. Yeast Culture did a lot of field recordings around the islands in Puget Sound, and in empty buildings. They inhabited a derelict 1950s apartment building known as Main Plant where shows were held and a shop was set up to sell noise records. Early records were made here. In the late eighties they moved to a downtown warehouse space, continuing the shop and publishing more records and hosting shows. Photography and screen printing and do-it-yourself tactics were used to create record covers and more. They developed a conceptual approach to sound recording, collecting together related field recordings to create produced work. Their sound sources ranged from closely miked natural specimens such as trees and water, to live electric plasma, empty industrial sites and historical military forts. Studio techniques included musique concrete style tape manipulations, custom editing processes, and gear and environments which were designed specifically for each project. In the late eighties through the early nineties Yeast Culture actively participated in the European noise scene, working with the Dutch labels Korm Plastics and Midas Music, and also German labels Quiet Artworks and Selektion. The group did a gallery sound installation to accompany photography for Arthur S. Aubry, and would often conduct experimental recordings of visiting artists in their studio performance space, known as Incubator. A soundtrack and short film was also prepared with Shade Rupe. In the early nineties, after having to vacate their studio space in the downtown Seattle area to make way for an urban development project, the group unofficially disbanded despite having accumulated a trove of incomplete recordings. The label started by Yeast Culture is Petri Supply.